This is really an abandoned art form – writing. We can all type really well and we often have digital journals or places on our computer where we put small notes to ourselves. But there is something different that happens with our brains when we use paper and pen. This probably seems pretty crazy coming from a person who uses social media and blogging as her means of communication here. 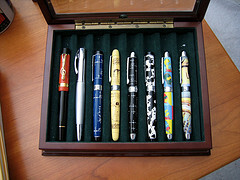 But I also have several journals and lots of favorite pens. In fact, if you talk to anyone who knows me they would describe me as obsessed with pens and tell you to never let me in an office supply store. I find that when I write with pen and paper, the delay between the thought and the hand’s ability to get it written on the page creates a small, thinking space. In that space I find my mind comes up with many things that seem to be lost when I type at a computer. In other words, I think writing with pen and paper slows down our thinking so we have a chance to let thoughts get in that would otherwise be lost or ignored. When you are working as a service professional you find yourself in lots of different circumstances. If you always carry a pad and a pen you can take a few minutes to jot down your observations or thoughts. When you go back to them later you will find that there are things you had totally forgotten about as you moved to the next thing on your list. And sometimes those things were important. One of my favorite books is “The Artist’s Way” by Julia Cameron. While the book is about the development and expansion of your creative self, I found many of the exercises and suggestions to be helpful and useful to enhance many of the every day elements of my life – including my professional work. Morning pages is one of her first exercises and I recommend it as a way to increase your ease with writing as a thinking tool. You simply get up in the morning and write for three pages. You don’t lift your pen, you don’t let yourself think too much (or as little as you can), and you don’t worry about making sense or making corrections. When you do this exercise, you experience the sensation of letting your feelings go directly to the paper without the censoring or your mind. It’s a great experience – and it can help you use writing as both a stress reducing exercise and a tool for surprising insights.